The new Robot Skin GH5 is an innovative professional cage designed to fit like a glove around the latest mirrorless Lumix GH5 cameras featuring the exclusive LockCircle “Asymmetrical Design Approach” for right hand camera grabbing and control with the original camera ergonomic feeling. Designed for comfortable grip and action, leaving on the left side of the camera all the production tools and accessories mounting: a still and film camera without the limitations of other cages. The asymmetrical concept can be upgrade with the Side Bar to add other accessories and rigging solutions on the right side. A special ergonomics approach offers the action/control of the camera knob selectors and on/off lever from the back of the cage across two cnc machined “finger channels and camera dials can be directly viewed from the top plate across two splits. Something more than just wrapping around the Lumix GH5 with a metalic cage with some threads: a natural extension of the original camera shape! The Robot Skin is designed for filmmakers using the original Panasonic DMW-XLR1 microphone adapter on the GH5 hotshoe. The Top Grip Handle Extension mount, offers an ergonomic handling of the camera set-up with the Microphone Adapter mounted. The Robot Skin GH5 integrates the MultiPort for secure connectors locking HDMI/USB-C/Headphone and Microphone mini-jacks. LockPort Flex kits are available for the USB-C to full-size USB 3.1 and for the Full-Size HDMI male to female output. A professional grade of mounting plates and Positive-Lock Mounts for universal cine-style lens mounting offering precise professional follow-focus work. 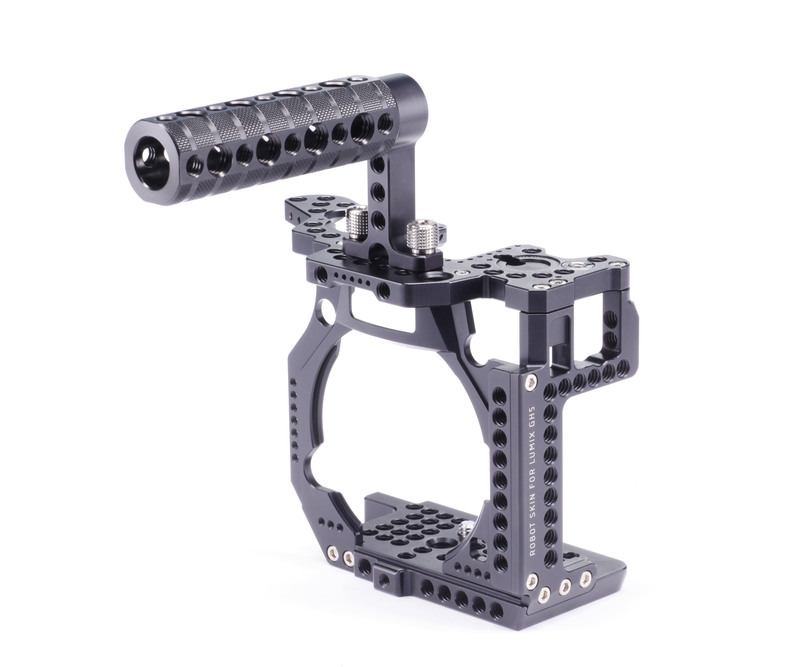 The Robot Skin GH5 baseplate has a mounting “receiver”for the Meta Block (adjustable), designed for a Metabones “state of the art” mounting/locking, and a IMS-Block for high grade professional Positive-Lock Mounts (PL-Mount, Canon EF, Nikon F, Panavision, Leica R). Vertical mount of the camera is available and compatible with the LockPort Flex System, and all along the Focal-Plane there are several threads for the (AC) tape measurement hook mounting. A titanium grade 5 camera screw is standard. - Asymmetrical classic LockCircle cage design concept. - Right hand camera grabbing/control with original Lumix GH5 camera ergonomics. - Innovative SFA Straight Function Action with DTV Dials Total View design concept. - Right Side Bar (total wrap) expansion module for right hand accessories/grip handles. - 90 (110 threads with the Side Bar) 1/4”-20, 3 (5 with the Side Bar). - Top Grip handle and Boombooster compatible accessories. - Top Grip extension handle for the Panasonic DMW-XLR1 Microphone Adapter. - CNC machined from billet aircraft grade aluminum. - Ultra-Lightweight and professional heavy-duty grade strength. - High quality organic anodizing with “professional grade” velvet surface finish. - Custom genuine titanium grade 5 screws and knobs. - MultiPort HDMI/USB/Audio port savers with connector locking. - Meta-Block mount (adjustable) for Metabones monolithic mounting. - IMS-Block for IMS - Mounts for the serious cinematographers needs. - Several IMS Professional lens mounts available: PL-Mount, Panavision. - Leica-R, Canon EF and Nikon with Positive-Lock. - New MicroMega-M ultra compact modular expandable 15mm baseplate. - Focal Plane thread for AC measurement custom titanium hook. - New hi-tech deep anodized colours: Noir Black, Blumix and Purple Rain (special orders). - Designed by cinematographers and manufactured in Italy.